This Pink Passion Smoothie Bowl is based with pitaya and raspberries to make it the perfect combo of sweet and tangy! You can buy pitaya packets at almost any grocery store in the frozen fruit section. I get mine from Whole Foods. Click here for the brand I use. A powerful blender is key to making thick smoothie bowls. I have been using Blendtec for years and absolutely LOVE it. It blends everything SO fast and SO smoothly! Click here to get your own! Frozen bananas are the most important part of any smoothie recipe. They make the texture perfectly smooth and creamy. I freeze mine ahead of time so I never run out! It is best to wait until your bananas are super yellow with brown spots before you freeze them because they will make your smoothies extra sweet. To freeze your bananas make sure you peel and chop them before you place them in a zip block bag. I’ve seen people try to freeze bananas whole and trust me, it’s a disaster. The peel will be impossible to get off and the blender will have a real rough time trying to blend an entire frozen banana. Wednesdays are hard. Beyond just the typical middle-of-the-week slump, Wednesdays are typically my busiest day. I get up early, workout, and then go to the studio to teach all day. It takes a lot of energy to make it through the day, and that's why eating a solid breakfast is more important to me on Wednesdays than any other. My favorite (vegan) breakfast is this beautiful Pitaya Smoothie Bowl! The bright color, delicious taste, and powerful nutrients are all I need to start my day off right. I love smoothies, but even I can admit that sometimes they get a little boring. 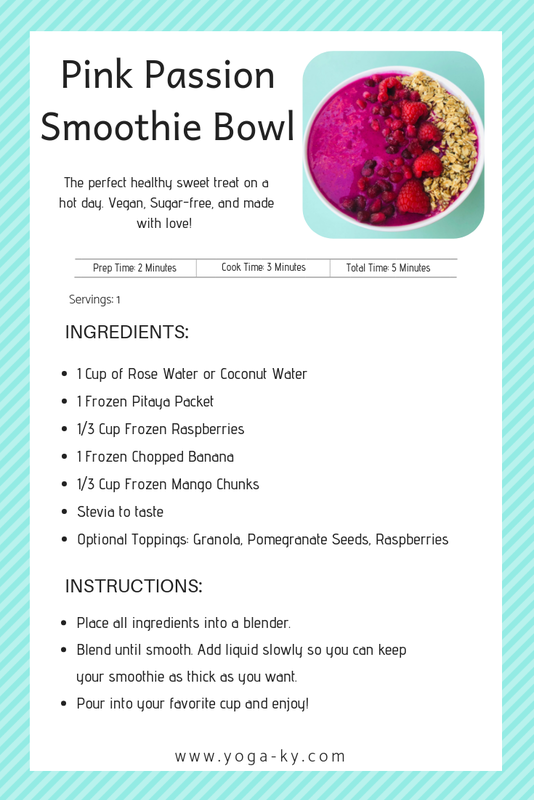 That’s why smoothie bowls, even simple recipes like this one, are one of my favorite things to make. Just the fact that you can eat it with a spoon instead of drink it automatically makes the bowls that much better than regular smoothies (for when you don’t have to eat it on the go, anyway).